Tuath Housing Association lodged its planning application with Dublin City Council last week to seek permission to refurbish the vacant Ellis Court building. 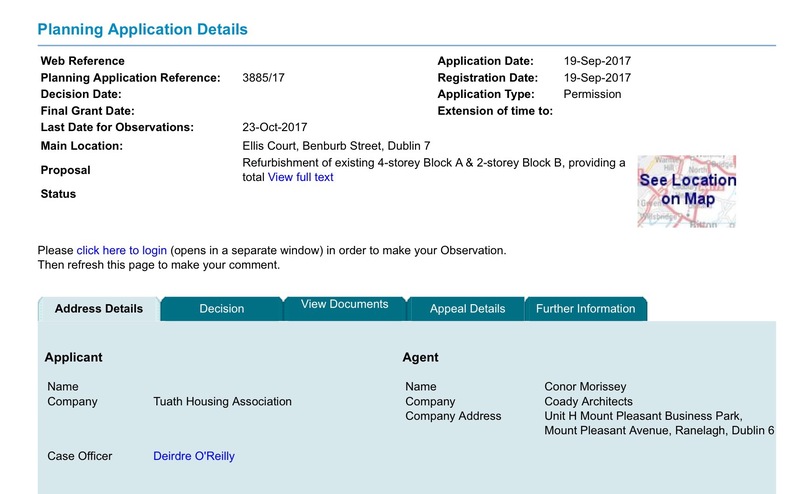 The application was registered on September 19th last and the Planning Reference Number is 3885/17. Refurbishment and deep retrofit of both Blocks A & B. Provision of 22 homes, including 6x 1 bedroom apartments, 13x 2 bedroom apartments, 2x 2 bedroom townhouses and 1x 3 bedroom townhouse. The existing rear return to Block A will be demolished. Construction of a new 4x storey extension to Block A. All existing railings and gates at the entrance to Ellis Court will be removed. Provision of no car-parking spaces but 22x bicycle parking spaces within the courtyard. Installation of new foul and surface water drainage infrastructure. The public consultation period for interested parties to lodge an observation ends on October 23rd 2017. If you would like to meet with the Planners in Dublin City Council to discuss the particulars of the application, please let me know and I will arrange such a meeting. This entry was posted in Arbour Hill, City Centre, Dublin City Council, Housing, Montpelier, Quays, Smithfield, Stoneybatter. Bookmark the permalink.